Loree Griffin Burns, author of The Hive Detectives and Tracking Trash, returns with a new nonfiction book that will inspire kids to become observers of the world around them. Burns defines citizen science as "the study of our world by the people who live in it." Citizen Scientists focuses on four different types of animals that can be found in our backyards: butterflies, frogs, birds, and ladybugs. The book provides readers with details about how to locate the animals and how to document their observations. The second person narrative and rich use of language puts readers in the shoes of naturalists. In the following excerpt, Burns perfectly captures how intensely you must listen when trying to count frogs at night. "Dishes clank as someone inside loads the dishwasher, and you can just make out the muffled sound of the radio. You let those noises drift into the background, force your ears to search for other sounds. There aren't many: the drone of traffic on a far-off highway, the neighbor's front door opening and then slamming shut. Silence. But somewhere in that unusual quiet you suddenly hear a short pip of a noise. Again. Now two, in quick succession. Spring peepers! You look at your watch and start the timer." Each chapter includes lists of equipment needed to observe and count the animals and information about organizations that coordinate counts around the country. Close-up photos of adults and children taking part in bird counts, butterfly tagging, frog identification, and ladybug projects compliment the information. Kids will love trying to answer the "Quick Quiz" at the end of each chapter. This book is the complete package. It has great kid appeal; it will educate and inspire readers. I was really impressed by the back matter. Each animal featured in the book has its own page of resources in addition to a bibliography, lengthy glossary and extensive index. Whether reading Citizen Scientists with a class or independently, the book is sure to strike a chord with young readers. 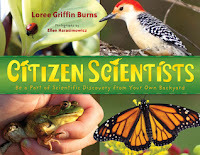 Burns provides web site links to bird counts, butterfly watches, ladybug projects and frog watches for readers who wish to become citizen scientists at home. What a great book for spring! It is almost time here in Japan to go out to look for giant stag beetles, I would love to have this book for my kids to see the differences in flora and fauna between here and North America. The Hive Detectives was good, so I need to take a look at all of these. I am going to look into this book. 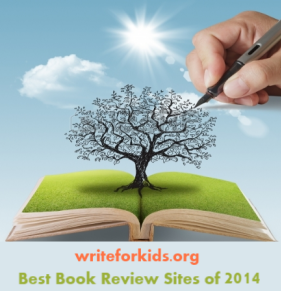 I love books that engage and expand the way children look at the world. My kids loved the hive Detectives...the little passage you shared is filled with such engaging writing. I'll have to check this out!